The subphylum Chelicerata is one of the five subdivisions of the phylum Arthropoda, with members characterized by the absence of antennae and mandibles (jaws) and the presence of chelicerae (a pincer-like mouthpart as the anterior appendage, composed of a base segment and a fang portion). Extant chelicerates include spiders, scorpions, ticks, and mites (class Arachnida), horseshoe crabs (class Xiphosura or Merostomata), and sea spiders (class Pycnogonida). Chelicerata is one of five subphyla into which arthropods are typically divided. The other subphyla are Trilobitomorpha (trilobites), Myriapoda (millipedes, centipedes), Hexapoda (insects), and Crustacea (lobsters, crabs, barnacles, shrimp, copepods, etc.). Chelicerates, which are mainly predatory arthropods, ultimately outlasted the now extinct trilobites, the common marine arthropod of the Cambrian era. Most of the marine chelicerates, including all of the eurypterids, are now extinct. The chelicerates and their closest fossil relatives (mostly originally included in the Xiphosura) are grouped together with the trilobites to form the taxon Arachnomorpha. Chelicerata reflects both the diversity and unity in nature, having a unique body form distinct from other arthropods, and yet this large and varied group of invertebrates, found worldwide, all share similar attributes from a common lineage. As with all arthropods, chelicerates are characterized by the possession of a segmented body, a pair of jointed appendages on each segment, and an exoskeleton. In the Chelicerata, the body is divided into two parts. The anterior part is called a prosoma (or cephalothorax) and is composed of eight segments plus a presegmental acron. 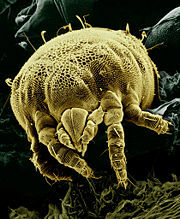 The posterior part is called a opisthosoma (or abdomen) and is composed of twelve segments plus a postsegmental telson. The prosoma usually has eyes. The first two segments of the prosoma bear no appendages; the third bears the chelicerae. The fourth segment bears legs or pedipalps, and all subsequent segments bear legs. The legs on the prosoma are either uniramous or have a very reduced gill branch, and are adapted for walking or swimming. The appendages on the opisthosoma, in contrast, are either absent or are reduced to their gill branch. As in other arthropods, the mouth lies between the second and third segments, but whereas in other groups there is usually a pair of antennae on the last preoral segment, here there are none. The chelicerae, which give the group its name, are pointed appendages that grasp the food in place of the chewing mandibles most other arthropods have. Most chelicerates are unable to ingest anything solid, so they drink blood or spit or inject digestive enzymes into their prey. The Pycnogonida actually show some strong differences from the body plan described above, and it has been suggested that they represent an independent line of arthropods. They may have diverged from the other chelicerates early on, or represent highly modified forms. Sometimes they are excluded from the Chelicerata but grouped with them as the Cheliceriformes. The largest class of extant chelicerates is Arachnida, which includes spiders, ticks, mites, daddy longlegs, and scorpions, among others. Eurypterida is an extinct class that predates the earliest fishes. The eurypterid (sea scorpion) was the largest known arthropod that ever lived (with the possible exception of Arthropleuridae). The largest, such as Pterygotus, reached two meters or more in length, but most species were less than 20 centimeters. They were formidable predators that thrived in warm shallow water in the Cambrian to Permian from 510 to 248 million years ago. Although called "sea scorpions," only the earliest ones were marine (most lived in brackish or freshwater), and they were not true scorpions. Xiphosura is a class of marine chelicerates, which includes a large number of extinct lineages and only four recent species in the family Limulidae, which include the horseshoe crabs. 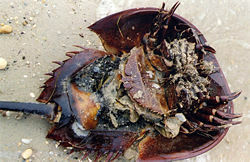 The group has hardly changed in millions of years; the modern horseshoe crabs look identical to prehistoric genera such as the Jurassic Mesolimulus, and are considered to be living fossils. The name Merostomata as the class of horseshoe crabs is traditional, but is unpopular in cladistics taxonomies because in all recent cladistic hypotheses it refers to a paraphyletic group composed by the Xiphosura + Eurypterida. The Burgess shale animal, Sanctacaris, and perhaps the aglaspids, may also belong here. These are extinct forms that arose in the Cambrian, and the aglaspids are believed to have died out during the Silurian. After them, the oldest group of chelicerates are the Eurypterida, found from the Ordovician onwards. When young, these show a resemblance to the trilobites, suggesting a possible relationship between these two groups. Boudreaux H. B. 1979. Arthropod phylogeny with special reference to insects. New York: John Willey & sons. ISBN 0471042900. Ciurca, S. J. 2000. The Silurian eurypterid fauna Prehistoric Pittsford. Retrieved December 19, 2007. Clarke, J. M., and R. Rudolf. 1912. The Eurypterida of New York. Albany: New York State Education Department. Dunlop, J. A., and P. A. Selden. 1997. The early history and phylogeny of the chelicerates. Pages 221-235 in R. A. Fortey and R. H. Thomas, eds., Arthropod Relationships. Systematics Association Special Volume Series 55. Maddison, D. R. Arachnida. Spiders, mites, scorpions, whipscorpions, pseudoscorpions Tree of Life Web Project, 1995. Retrieved December 19, 2007. Whyte, M. A. 2005. Palaeoecology: A gigantic fossil arthropod trackway. Nature 438: 576-576. Winnepenninckx, B. M. H. 1998. Arthropod relationships. R.A. Fortey and H. Thomas, eds. Trends in Ecology & Evolution 13(12): 519. This page was last modified on 2 April 2008, at 04:29.